With over 35 years of sewing and design experience, you can be sure of quality workmanship conducted with care and passion. 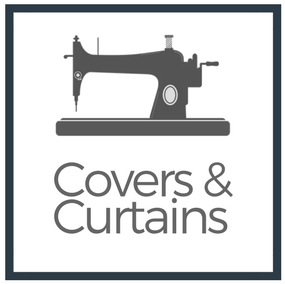 At Covers & Curtains, our priority is ensuring that our clients are delighted with their choices. After all is it your home and you will want to admire your soft furnishings for years to come. Based in the UK and France we can offer both countries the best that both countries offer. The innovative designs from the UK with the style of the chic French. The first step is a personal consultation either in your home or via video calling. This ensures that we get to know our clients and fully understand their needs. To best meant your needs, we like to understand your lifestyle, features in your home and get a sense of your personal style. Some of our clients already know exactly what they want and have chosen their fabric and styles and just want quality workmanship. Some seek guidance on fabrics, colours and designs. Some clients simply require one roman blind or pair of curtains and others an entire house of window dressings, loose covers and cushions. As much or as little support can be provided to suit your needs.